This 18-storey, 143-unit condo/townhome project was finished in 2009 and offers spectacular views and spaces. It's the ultimate location, central to downtown recreation spaces and only 2-4 blocks from every commercial part of downtown Nanaimo. The views from every unit in the tower are panoramic, with some having views in BOTH major directions; east to the oceanscape and west to the city and mountain views. Down in the townhouses there is a cool courtyard, easy access to the harbourfront walkway, and many residents have unimpeded views of the ocean just 15 meters from their windows. The tower has 1-bdr and 2-bdr condos. Down around the courtyard, there are several 2-bedroom units (1100-1200sqft) facing into a bright, interior plaza. Three units have sold in 2017 for $360-385k. 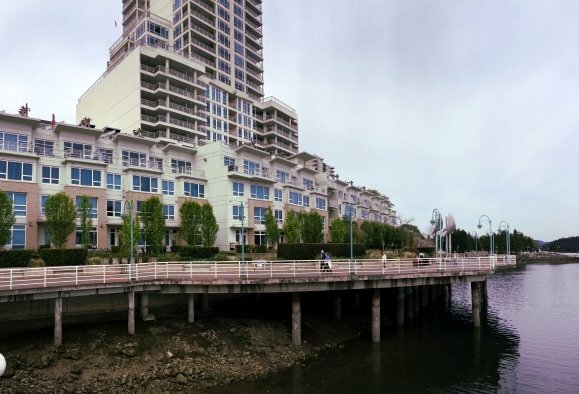 There are a handful of 2-bed and 3-bed townhomes down at the level of the harbourfront walkway (or slightly above it). They range in the 1100-1200sqft range for the 2-bedroom units, whereas at least one of the 3-bed condos has 1740sqft. Several of these are currently for sale in the high $500s. Please contact me if you have any questions about Pacifica or if you'd like to get inside any units currently for sale.